some exciting new ventures that I cannot wait to share with you!! HGTV will be re-airing along with all of the never-before seen episodes. We’re so excited for it to finally be out there!! We had the brick painted white, and shingled the little addition on the left with cedar shingles and added cedar shutters and window boxes for charm. and moved this vintage secretary from their little office into the foyer which fit perfectly. Here’s a look at the original living room which the front door opened into, making it feel more like a throughway than a living room for the family. We added a wall with a large cased opening just before the windows to create a separate foyer and living room. height to the center of the room. I generally prefer casual, wild-feeling greenery and branches for a laid-back, relaxed vibe. The amazing painting was given to our clients by super- talented artist Chelsea Fly – whose website is here . I had so much fun arranging their keepsakes around the house, including the pieces on the coffee table. All they knew was that we were moving the piano in there but we decided to surprise them with a fully-decorated music room for the girls. I found a funky little blue capiz shell light for the corner I thought the girls would love and added a few fun vintage touches. I really loved the quality of the light in the room and knew it could be arranged so much more functionally. the wall separating the kitchen from the family room, replaced the existing window with a larger one and rearranged basically everything. 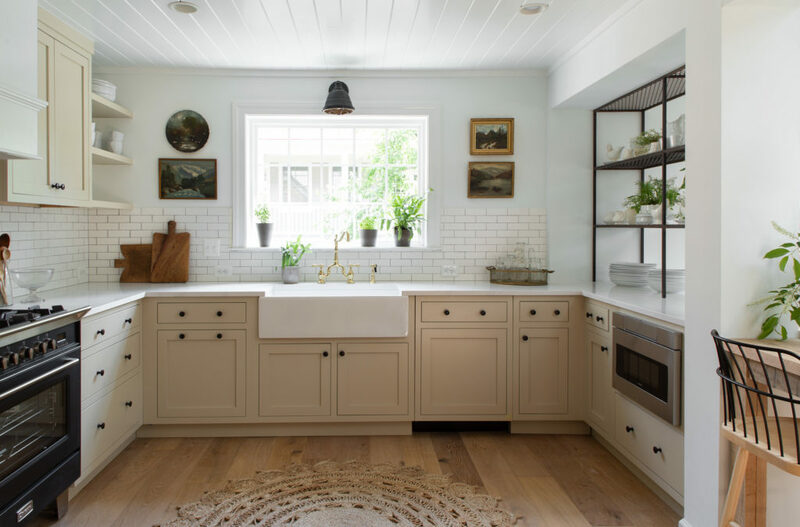 I went with putty-colored cabinetry and lots of white which felt soft and relaxed. New wide plank white oak floors warm up the space. I love love LOVE antique oil paintings and flanked the window with a small collection to add patina and color. in the addition which was already paneled. hardware, the barstools, the range etc. The countertops area marble-look silestone and we installed an undercounter microwave, which is something I almost always do in kitchens. porch also knocked into the table when it was open. comfortable for nice long meals. I had the beams sanded down (I’m still thankful to the CarrMichael Construction team for that painstaking work!!) to add warmth and texture. I love the texture of the stucco on the fireplace. can store things like coats & backpacks and the baskets can hold shoes and hats and scarves. crew, our clients, my team, all of the vendors, manufacturers and artists we worked with, and Mike Carr and team at CarrMichael Construction!! at those times on the HGTV streaming app so will keep you posted on that!